P.G. 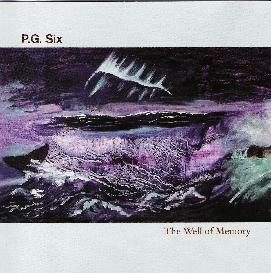 Six - "The Well Of Memory"
Drawing on the tradition of British folk groups like The Incredible String Band and Pentangle, that combined traditional acoustic music with subtle psychedelics, and throwing in a dash of the experimental guitar style of John Fahey, New York's Pat Gubler, under the moniker of P.G. Six, weaves his own brand of spacey folk music on this, his second full length release. Utilizing not only the acoustic guitar, but other intriguing instruments such as wire strung harp, wind harp, and tenor banjo, Gubler swirls these together on his sonic canvas with more modern instruments like electric guitar, synthesizer, and Wurlitzer electric piano to create a unique sound that is at once traditional but also innovative and fresh sounding. I'm tempted to call this a folk album, but really, with its colorful palette of lush sonic textures, spacey breaks, and freaky experimentalism, the heart of The Well of Memory is definitely a psychedelic one. This can especially be heard when Gubler dispenses with the folk backdrop, and combines tin whistle with laidback, electric rock riffs on Three Stages of Band, or when he spaces out totally as he does on The Well of Memory Part I and its even more experimental Part II. Still, he can certainly pull off a more traditional sound as well, as he does on the beautiful medley of Come In/The Winter It Is Past, but even on this track, there's a trippy space bridge that ties the two pieces together. Of course, don't let my frequent use of the word "experimental" necessarily turn you off. Gubler has still created a rich, eminently listenable experience, one that will take you far, far away from your ordinary life into a strange a beautiful world, perhaps a place from memory or maybe just from imagination. Dip into The Well of Memory and drink of its refreshing waters. You will not regret it. Highly recommended. For more information you can visit the Amish Records web site at: http://www.amishrecords.com. Contact via snail mail c/o Amish Records; PO Box 1841; NYC, NY 10013.